First season of the Monogatari Series, part 2/6. 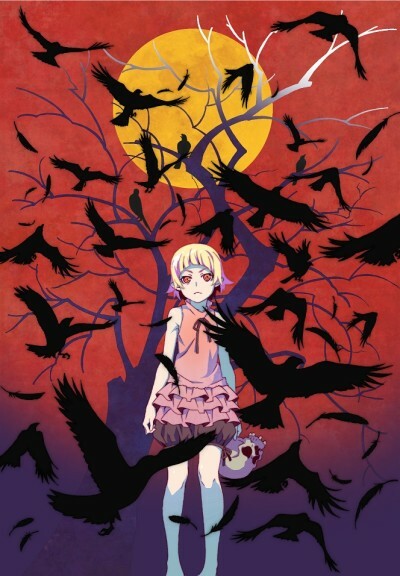 Contains the arc Koyomi Vamp from the Kizumonogatari light novel. Koyomi Araragi, a second year high school student at Naoetsu High School, befriends Tsubasa Hanekawa, the top honors student at his school. Hanekawa mentions a rumor about a "blonde vampire" that has been sighted around their town recently. Araragi, who is usually anti-social, takes a liking to her down-to-earth personality. That night, Araragi encounters the rumored vampire: she is Kiss-shot Acerola-orion Heart-under-blade, also known as the "iron-blooded, hot-blooded, cold-blooded King of Apparitions." The stunningly beautiful vampire cries out for Koyomi to save her as she lies in a pool of her own blood, all four of her limbs cut off. Kiss-shot asks Araragi to give her his blood, and when he does, the next moment he awakes, Araragi finds himself reborn as her vampire kin. As Araragi struggles to accept his existence, Kiss-shot whispers, "Welcome to the world of darkness..."
Charming and engaging the whole way through, even if it's only a foundation.